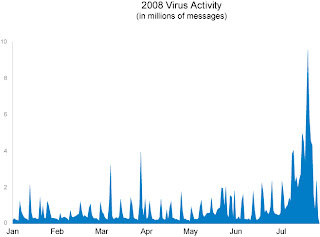 In July, our Postini datacenters saw the biggest volume of email virus attacks so far in 2008, with a peak of nearly 10 million messages on July 24. One of the more prominent attacks in the month involved a spoofed UPS package-tracking link that was intended to lure recipients into clicking on it and downloading malware. Our zero-hour virus protection technology first started catching these emails on July 20. Many of the viruses we see follow a similar format, in which an email with an embedded website link in the message is changed from what the link displays. Another recent example was a spoofed CNN newsletter sent out by spammers. In this case, the content included current news stories with numerous links in the message. The majority of the links were valid, but there were some that were replaced with malicious links. As soon as our technology started detecting these messages, we implemented a filter to stop these elusive viruses and voila! -- all of our 14 million business users were protected. This network effect and rapid protection against these new tactics is why businesses are increasingly moving their email security into the cloud. Viruses tend to increase during the summer months, and August is already showing some new types of viruses. On August 5, we saw a large inflow of messages with an encrypted .RAR attachment. The overall 2008 trend has been a decrease in the use of attachments, so this new virus is confirmation that spam doesn't follow trends for long. These examples are also a good reminder about the importance of educating our colleagues, friends, and family on how to safely interact with email -- namely, that we should all be careful about clicking on links in emails, even if those messages appear to be from people or organizations we know. Join Google security experts for an upcoming webinar for IT professionals that will explore the topic "How spam is changing your business email, and what to do about it" on Friday, August 15, at 10:00 am PDT. For more information on how Google can help your business secure its email and web traffic, visit us at www.google.com/a/security. that can index 10 million documents in a single box. We're hoping this will be a great help to IT departments burdened with typical enterprise search implementations -- many of which require dozens of servers and multiple administrators to search content at this scale. Now organizations will be able to offer their staff secure search across the largest enterprise content sources —Documentum, Filenet, LiveLink, and Sharepoint—all from one easy-to-maintain appliance. While we can't promise that the avalanche of information will decrease, administrative features with the new appliance, such as the ability to adjust search results for user groups based on department or function, results-biasing based on metadata, (in addition to source, URL, or date), enhanced search analytics, localized interfaces, and the rapid stream of innovation from Enterprise Labs should help employees spend less time searching for information, and more time using what they find to be as productive as possible -- no matter how much is on their to-do list. It's 8:00 am Wednesday morning in Mountain View, California, and I'm already swamped. And if you're currently engaged in any business activity within the reach of this post, it's likely that your plate of assignments, projects, to-do lists, and the number and variety of data you'll need to complete them ahead of time and under budget, is also overflowing. According to most estimates, the amount of information employees will have to navigate with -- file shares, databases, document systems -- isn't going to shrink any time soon. * That's why today, in addition to going through our inboxes we're announcing a new Google Search Appliance that can index 10 million documents in a single box.